Have you ever been asked to provide sign language interpreting for domestic violence situations? Would you be prepared if you were asked? Example 1: You are assigned to interpret a family counseling session. You become aware the hearing husband just beat up his Deaf wife. The counselor is helping the couple with marriage counseling. Example 2: A police officer obtained your services to assist with communication about a dispute at a Deaf resident’s home. Hearing children are involved. You interpret interviews with the family so the officer can file a police report. Example 3: You are called into a court room for two Deaf women trying to obtain a restraining order. The judge needs to hear both sides of the story before granting the restraining order. While reading the examples, did you feel anxious, nervous, or sick to your stomach? These situations happen every day, and sign language interpreting for domestic violence situations is needed more frequently than you might think. In fact, 1 in 4 Deaf women are victims of Domestic Violence and 1 in 3 Deaf women are victims of Sexual Assault. (ADWAS) Domestic Violence (DV) is defined many ways. In summary, it is a pattern of behaviors that one person uses to assert power and control over another person in an intimate relationship. 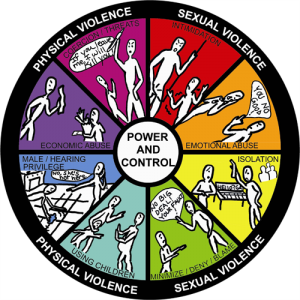 DV is not only a form of physical abuse, but it is also recognized in different types of abuse on the Power and Control Wheel. This tool is helpful in trying to understand the overall pattern of the abuser’s manipulative and violent behaviors. We, as professional Sign Language Interpreters, need to know our limits. You might not know your limit yet if you are still a student or new in the profession, but it is important to be true to who you are and listen to your gut. You will hear traumatic stories, have intense emotions, have safety concerns or maybe feel yourself judging the victim. People may ask, “Why do they stay?” I think the most important thing you can do is NEVER ask this question! There are so many underlying factors (that you could never fully understand) that often the victim does not understand them all. The goal of the abuser is to confuse, intimidate, and control the victim. It is so important to educate yourself, take DV training, or research facts about DV before taking an assignment of this caliber. One practical strategy to help break the silence of DV is simply to talk about it. Raise your and others’ awareness through education and outreach. Be able to identify red flags in an unhealthy relationship. This will also help you provide sign language interpreting for domestic violence situations with true understanding when this topic inevitably comes up. If you know someone who needs support, they can click on resources below. Deaf and Hard of Hearing individuals can call a 24-hour crisis line called Deaf Crisis Line at 321-800-DEAF (3323).